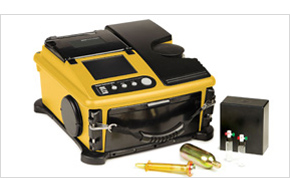 The GC-MS Mobile System is the world’s smallest person portable GC/MS, which is fast, reliable, and easy to use. The integrated system features a low thermal mass capillary gas chromatograph with high-speed temperature programming and a miniaturized toroidal ion trap mass spectrometer (TMS) with a mass range from 41 to 500 Daltons. Samples are injected using a novel CUSTODION solid phase microextraction (SPME) fiber syringe or a needle trap (CUSTODION-NT). The entire GC-MS Mobile System is totally self-contained, weighs 32 pounds, and is rechargeable battery operated. It is easy to operate with a color touch screen user interface or a simple three button navigation. The GC-MS Mobile System is ideal for rapid screening of chemicals including environmental volatiles and semivolatiles (VOCs/SVOCs), explosives, chemical warfare agents, hazardous substances and for use in food safety and industrial applications.